We had friends for lunch on Sunday, which is an excuse for me to make a scrummy pudding. Raspberry pavlova, to be precise, which I drizzled with a soft-set jammy compote using bags of berries that are still lurking in the freezer from last summer. The pavlova was great – it’s a distant memory now – but the bowl of leftover ‘jam’ remains. What to do? 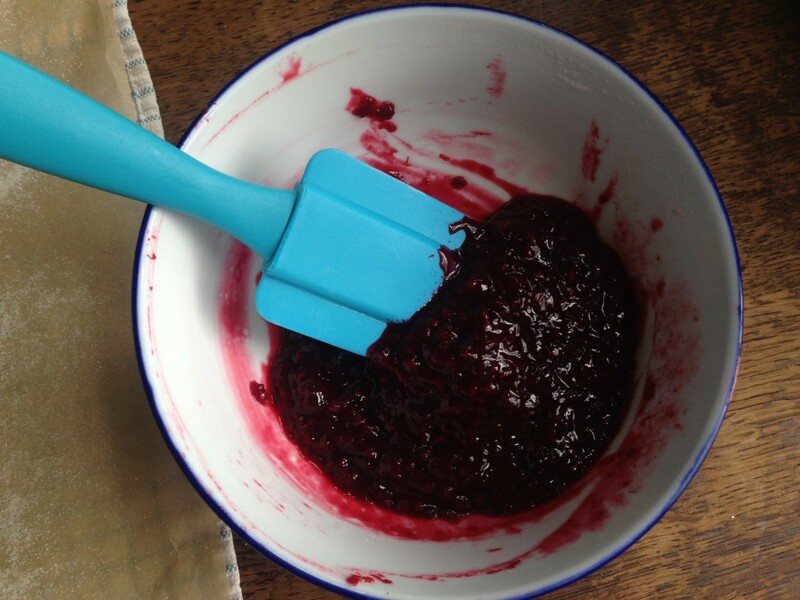 A bowl of leftover jammy-compote. What to do? The answer, *obviously! *, is to whip up a swiss roll. So between juggling phone calls and press releases and eshots this morning, that’s just what I did. I suppose there are some great benefits from working at home, and the ability to bake on a whim is one of them. 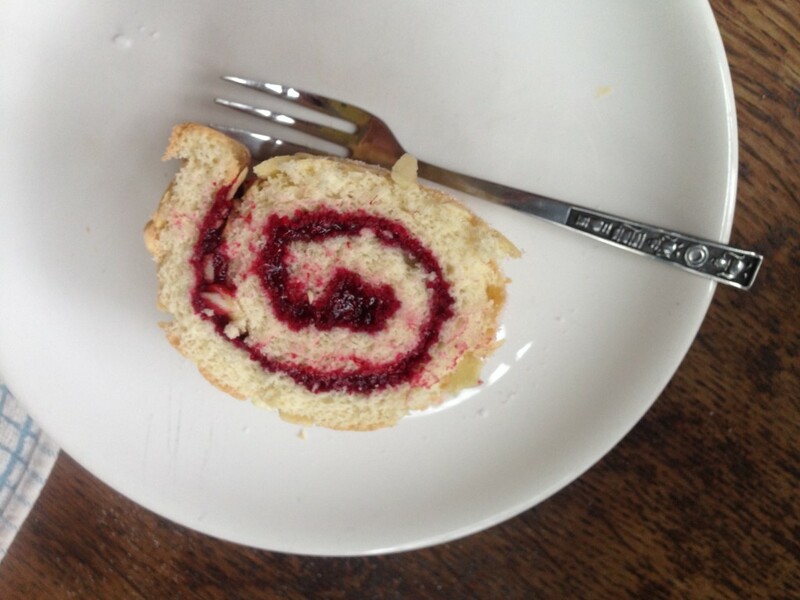 Once you’ve got your technique down, making a swiss roll is easy as pie. Actually, it’s LOADS easier than pie as all you need are eggs, caster sugar, flour and jam. Plus a few flavourings, if you want. Start by lining a swiss roll tin with greaseproof paper, and preheat the oven to 175c (fan). Beat the eggs and sugar into submission. About four or five minutes should do it. Then gently sift and fold your flour into the eggs, a little at a time. Spread the lot into your prepared tin, being careful not to knock the air out of your lovingly whisked sponge, and scatter a few flaked almonds on the top. Bake for 10 minutes but keep an eye on it – it might need two or three minutes longer in the oven. It needs to be just set, springy to the touch and slightly golden, but not over-done as a crispy sponge simply won’t roll. 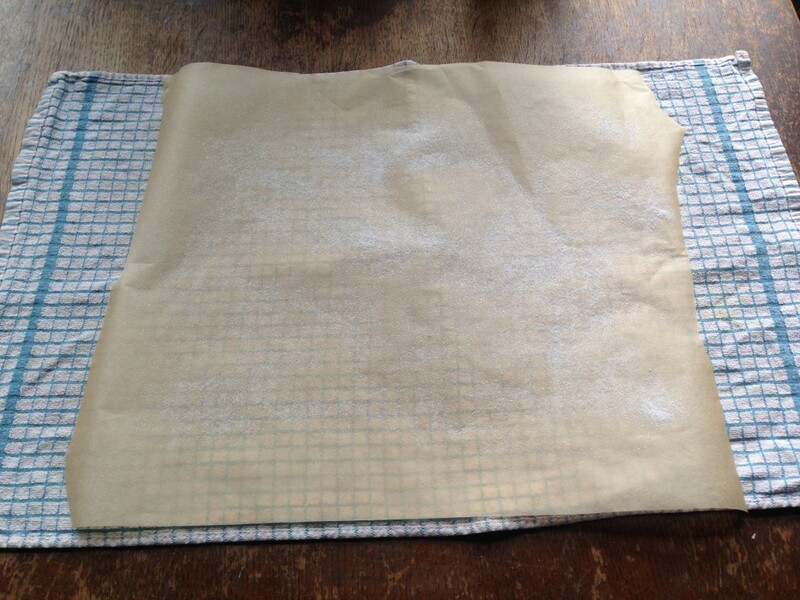 Whilst it’s cooking, prepare your rolling surface: a sheet of baking parchment sprinkled with caster sugar. I like to rest it on a tea towel, but that’s not essential. Prep for the roll! Get a sheet of baking parchment and sprinkle it with sugar. When the sponge is cooked, immediately invert it onto your prepared paper. If the sides are crispy, trim them off (I didn’t trim these but I should have done as they ended up cracking when I rolled the sponge). I like to fill and roll the sponge whilst it’s still hot to prevent the chances of cracking. 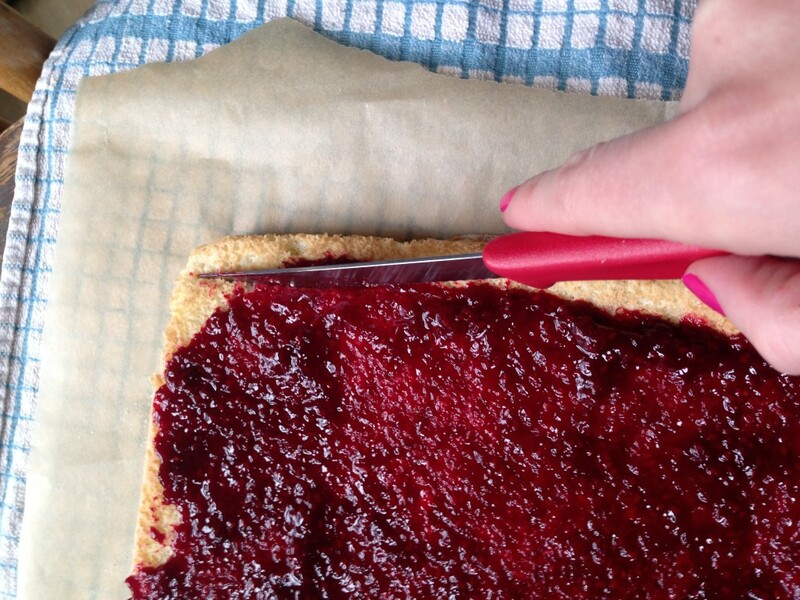 Spread your jam right to the edges of the sponge, then make a score about 1cm from one of the short edges of the sponge – this helps it to roll tightly. Now, deep breath, go for your roll! Use the paper to help guide the sponge into a roll, starting with the scored short side. Go slowly and it will come together into tight swirl, like this. Then roll up tightly from the scored short edge, using the paper to help you. You’ll get a swiss roll as reward for your efforts. Leave the sponge to cool completely on a wire rack, then get stuck in. Old-school jammy swirly easy goodness! 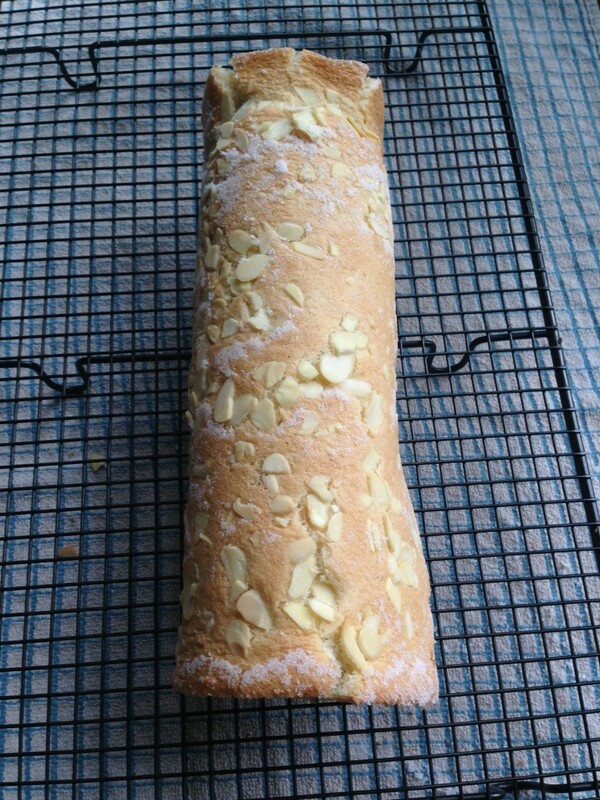 Plus you’ll need baking parchment and a swiss roll tin, about 35 x 25cm. Prepare the tin with baking parchment, and preheat the oven to 175c fan. Beat the eggs, vanilla and sugar together using an electric whisk until they are thick and fluffy, at least four minutes. Do not stint this bit, it’s really important to get air into the sponge. Using a very large metal spoon, fold the flour into the eggs in three batches, until the flour is totally combined. 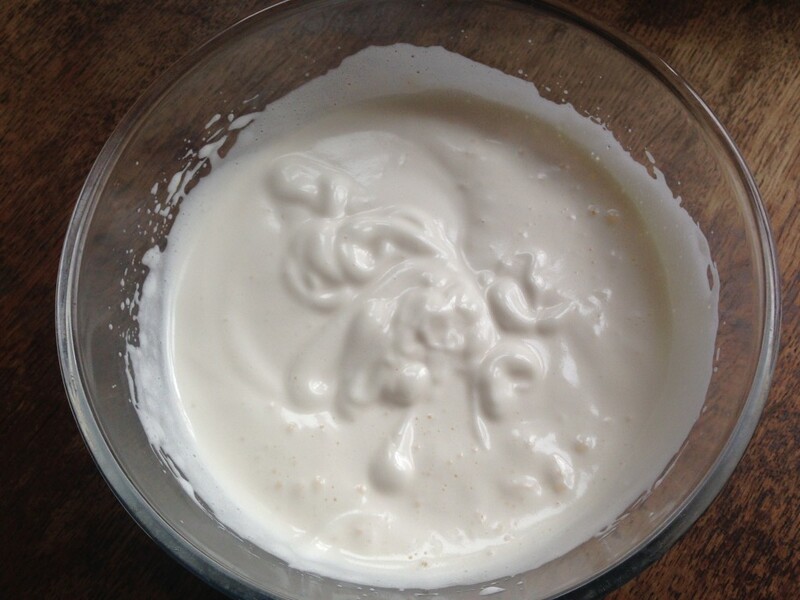 Be careful not to overwork the mixture; it needs to be light and fluffy. Gently pour it into the prepared tin and spread evenly, right to the edges. Lightly sprinkle with flaked almonds. Bake for 10-12 minutes until lightly golden and just set. 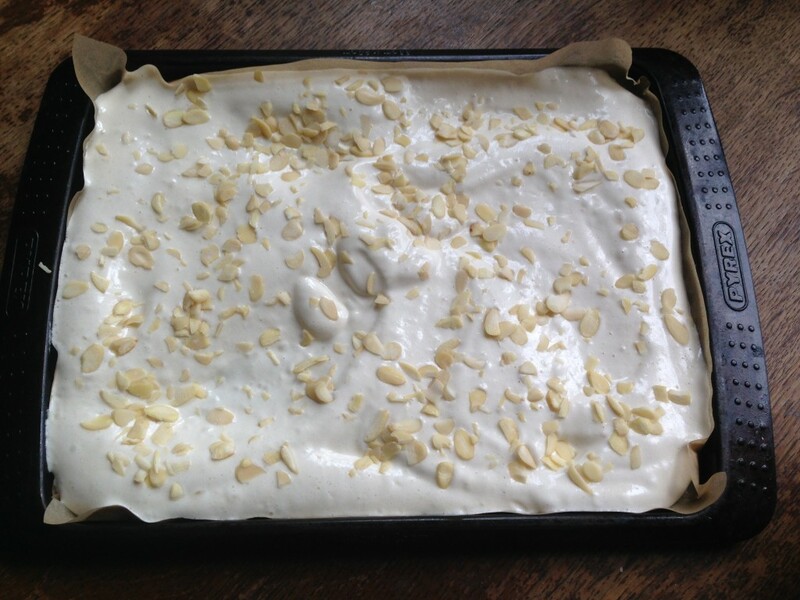 Lay a sheet of greaseproof paper that is larger than the cake, on top of a tea towel. Sprinkle the paper with caster sugar. 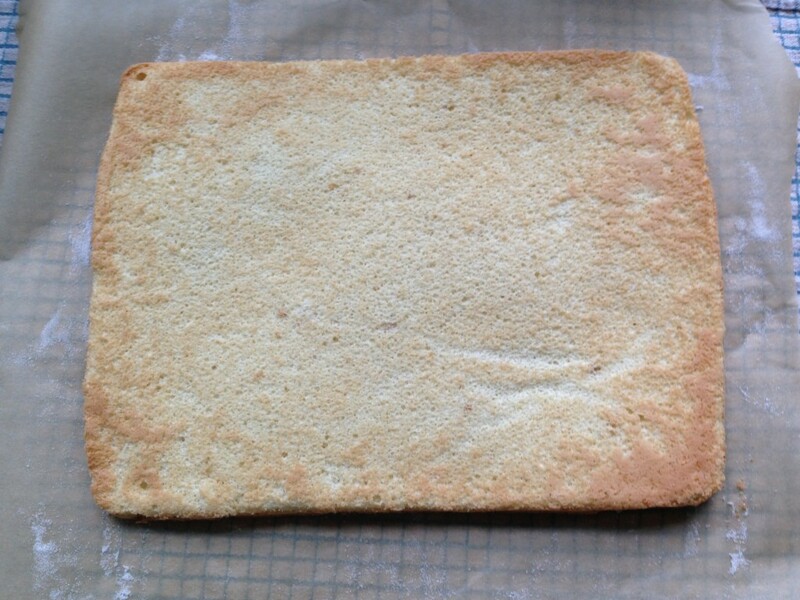 Invert the cooked sponge onto the paper, peel of its backing, and trim the edges of the sponge. 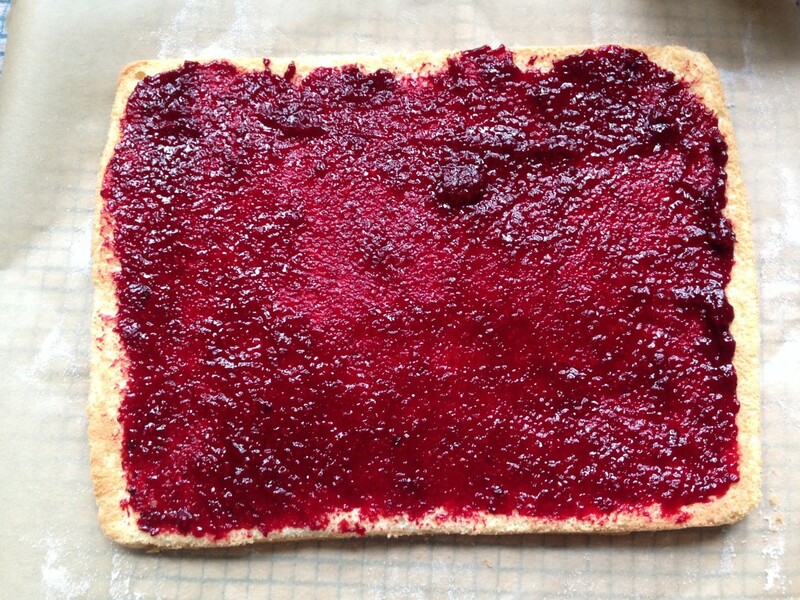 Spread evenly with jam, right to the edges. Score a line 1cm from the edge of one of the short sides of the sponge. Using the paper to help you, roll it up from the scored edge, easing it into a tight roll. Allow the roll to cool completely, seam side down, until you want to serve it. 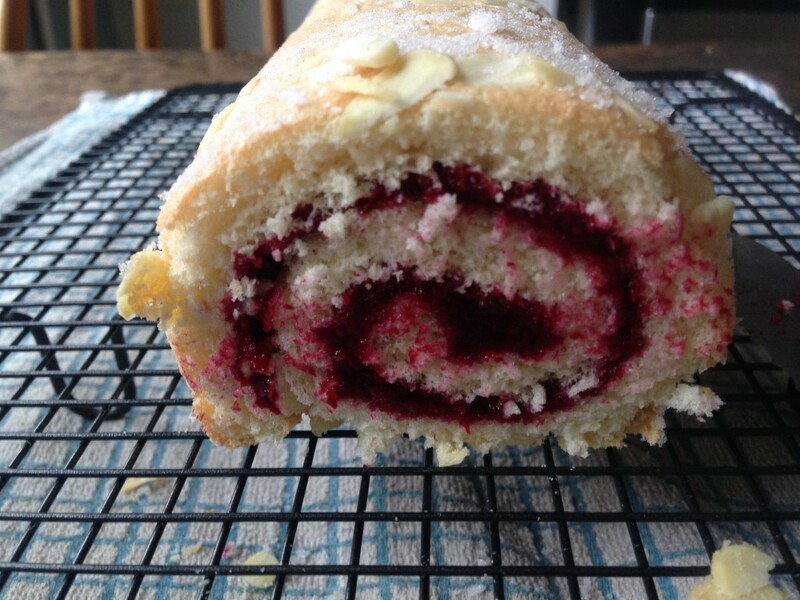 This entry was posted in Recipes, Sweet and tagged baking, jam, Raspberries, swiss roll. Bookmark the permalink.